One crucial part of being a penetration tester, it is to make a readable, high level and technical reports. Another interesting side to sharing this online is to help others break into those machines, see how the author went ahead and broke in and finally get feedback and meet new people. With that in mind here is my Moria write up! Moria is said to be an intermediate machine and it stays true to that, if you don't have a certain process to follow or refer to, you won't get the entry point. 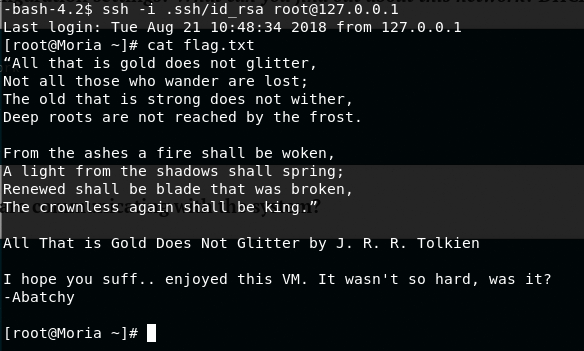 You can get the machine from Vulnhub. After identifying its location, we proceed to NMAP the box in a fast manner, using -F which provides us with the ports 21, 22 and 80. In order to cover the whole machine, another scan is run using -p- while discovering the service on port 80. On the landing page, we get an image with no other directions to go from. We run a dirbuster in the background as well and go check the NMAP results. Host is up (0.00030s latency). In general, finding out that FTP is open always results in juicy results. Trying to connect to that service, a greeting message for user Balrog gets displayed. Access wasn't possible since a password was needed. It looks apparent that the web service should point us somewhere in the right direction. Looking at the dirbuster results, a directory under 5-6 layers is discovered with the following URL http://192.168.156.130/w/h/i/s/p/e/r/the_abyss/ where random messages between prisoners are shown. A special message is knock . Talking geeky, whispering happens on the network. Combining that with that message, port knocking seems like a nice place to look at. The concept of port knocking describes that in order to get access to a certain closed port, a certain sequence needs to be done for it to open for the user. It's a repeating sequence! It goes from 77 to 57 and then repeats. Considering that this is more CTFy than any real life scenario, it hits me that those numbers can be an ASCII sequence. The numbers are in a very reasonable range for ASCII characters. After checking what those numbers were, the word Mellon69 is found out. Trying that password out in the FTP service, access is granted! Discovering the service, the only place where an upload can occur is on an ftp directory. That isn't much of a help if execution can't be triggered somehow. Knowing that, generally web directories are badly configured. Going to /var/www/html allows us to see the files and directories on that server. A hidden directory is found! Hashes .. Who doesn't like those. 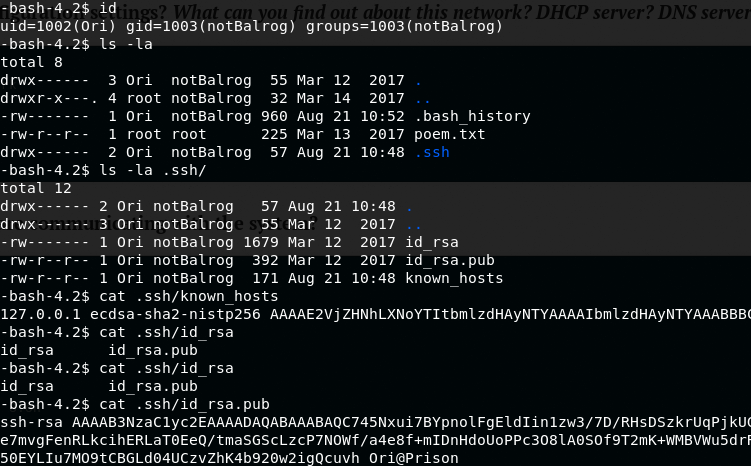 Trying to check those using online web services for hash cracking, 0 results are returned. No wonder those hashes returned nothing! 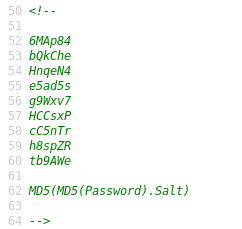 In order to get back the original password, I went ahead and created the following python script: https://github.com/ThunderSon/Moria1.1/blob/master/md5_cracker.py. It was the perfect opportunity to practice my python skills. Passwords can be inter-used, meaning that multiple users have the same password. You can use `patator` to test out the users with the password. In the end, Ori with the corresponding password was able to give us access. After checking /etc/passwd, it is apparent that Ori is the only existing user. Checking out the home directory of Ori, a .ssh folder pops out. That is a gem most of the times. 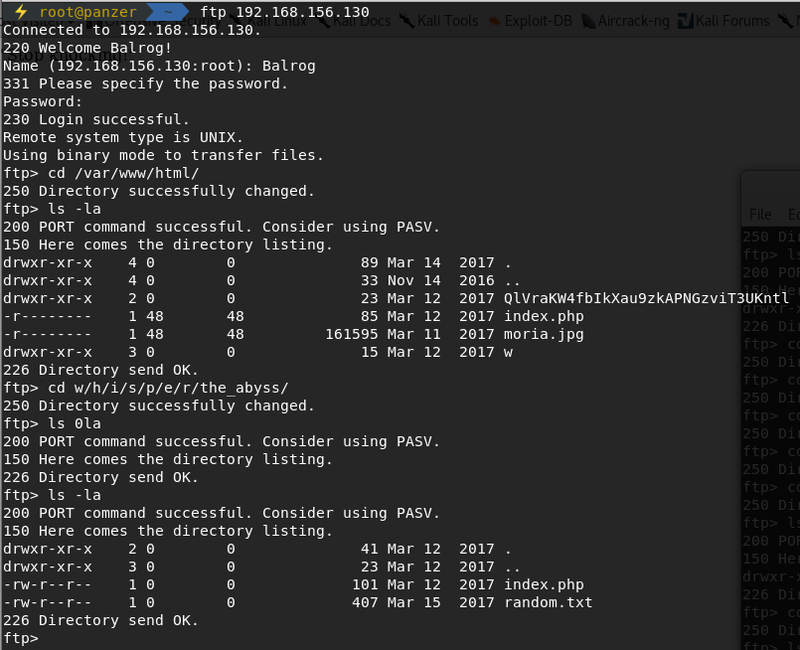 This directory gets created by the SSH agent on the system while creating keys to access the system, or when someone authenticates using ssh with an unknown key to the host. Checking the known hosts, we see the location of 127.0.0.1. Reading the public file to see if a user and a machine are appended at the end, we get Ori@Prison which is not very helpful. To avoid going down rabbit holes, the privilege checker is ran in order to try and identify weaknesses in the system. After having a quick look on the results, I mapped out the prison quickly. Normally, the master which is Balrog have keys to the chambers of the prisoners. Prisoners have no keys. The story isn't the same, but it surely tells that one has access to the other. In this case, Ori is able to access root. Simply trying to ssh as root gives us access! The author really showcased a prison in this machine. It was really fun to dive in and stepping into it. That final poem is a real gem as well. Abatchy has other write-ups for machines as well as an OSCP write up. If you enjoyed my writing you can find me on Twitter as @7hunderson. The awesome image used in this article is called "Doors of Durin" and it was created by Lesley Burr. Web application penetration tester with a love of development and threat modeling. Draw down free threat intelligence data to feed your security information and event management (SIEM) platform with these handy Powershell scripts. Defending your systems from advanced malware does not have to be difficult and costly. Learn how to improve your domain security with simple changes to tools you already own.